Below are our hand-picked 17 flight deals under $100 and rest under $200, one-way fare, from JetBlue Airlines. Of course, there are restrictions with every deal. Main restriction of these deals provided here are in terms of dates – These fares area available on select dates from 12/14/14 and 3/22/15. Read the fine print below the deals table to learn about them. We are not an affiliate of Jetblue airlines. These prices might change overnight. 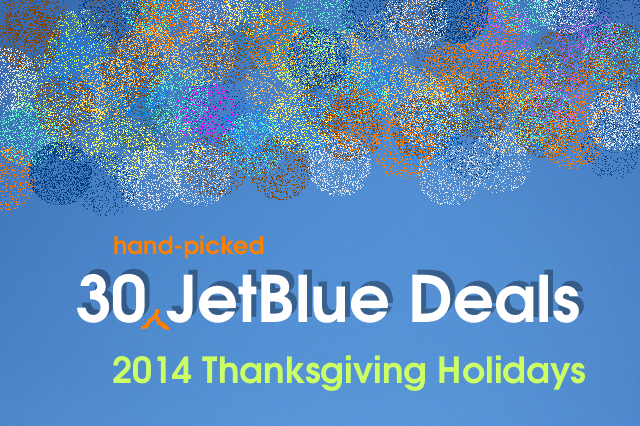 Go to JetBlue deals page www.jetblue.com/flights to get these deals. Alternatively, you could also get these deals by subscribing to Jetblue’s flight fare alerts. The table below has total of 30 deals but 20 deals displayed below. Click on the next page below the table to see rest of the deals. *This fare is available on select dates between 12/14/14 and 3/22/15. Fare may not be available during holidays or other peak travel days. Click on the fare to see a fare calendar showing the exact dates this fare is available. Any “Price Drop” that is shown is based on lowest bookable fare within the last 72 hours. Fare is subject to availability; may not be available on all flights; may change without notice; must be purchased at time of reservation; and is one-way, nonstop, nonrefundable and nontransferable. Reservations made one week or more prior to a flight’s scheduled departure may be canceled without penalty up to 24 hours after the reservation is made. Fare includes government taxes and fees. First checked bag is free (weight and size limits and exceptions for itineraries including flights marked or operated by other airlines apply). Fare does not include fees for oversized/overweight/extra baggage or other fees for products/services sold separately. To view baggage fees and other optional services and fees, click here. $25 fee per person applies to fares purchased by phone or at an airport or ticket office. Cancellations/changes must be made prior to scheduled departure (otherwise all money for fare is forfeited); $150 change/cancel fee per person will apply, and for changes, there may be a fare adjustment. Cancellations receive JetBlue travel credit, valid for one year. Proper documentation required for boarding. Other restrictions apply.